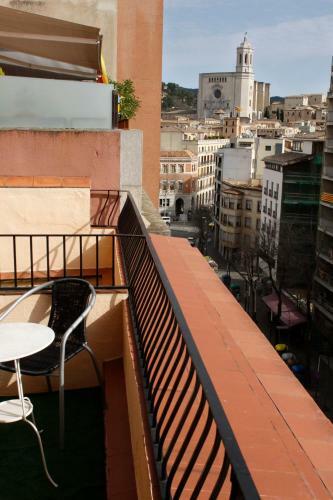 Hotel Ultonia is in the center of Girona, a 3-minute walk from the Old Town, Cathedral and Arabic baths. It features air-conditioned rooms with free Wi-Fi, flat-screen TV and minibar. The hotel provides a buffet breakfast and a cafe-bar where you can enjoy a drink or snack. From May to October, guests can access the roof terrace with impressive views of Girona Cathedral and its surroundings. There are also a variety of restaurants and bars within a 5-minute walk. A special bike storage area is available free of charge in the hotel, as well as a private underground parking garage, with free parking for motorcycles. Hotel Ultonia is next to Devesa Park, and just a 10-minute walk from the bus and train stations, with good connections to Girona Costa Brava Airport. Palacio de Fires Congress Centre and the city’s bullring are also just a 10-minute walk from the property. The staff at the Ultonia Hotel’s 24-hour front desk can provide tourist information about what to see and do in Girona, Barcelona and the Costa Brava.